Send the message to put a stop to bullying! 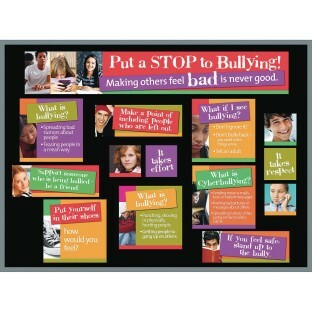 Send the message to put a stop to bullying with the Bullying Bulletin Board Kit. Bulletin board cards define physical, verbal, and cyber-bullying and offer tips of what to do if someone is being bullied. Two 5-1/2” x 17” title header pieces (become 5-1/2” x 34”) and a variety of photos also included. All pieces laminated for durability. Sized for a 3’ x 4’ bulletin board. Can be easily adapted to fit any size board.